In this mammoth work of love and scholarship, British biographer Fairweather (The Pilgrim Princess, 2001) delves into the fascinating, turbulent life of the French stateswoman and author. With her education firmly rooted in the 18th-century Enlightenment while her heart and literary imagination strained always toward the melancholy thoughtfulness of early-19th-century Romanticism, Germaine Necker de Staël (1766–1817) witnessed and influenced the extraordinary events of Revolutionary and Napoleonic France. As the privileged, well-educated only daughter of Louis XVI’s brilliant Protestant minister, Swiss banker Jacques Necker, Germaine possessed the intelligence and political savvy of her beloved father, yet because she was a woman (and ugly by the standards of the day) had to wield her power behind the scenes. Her dazzling salons were dedicated to bringing royalists and republicans together toward the high-minded goal of liberal idealism. Through an arranged and increasingly unhappy marriage to Swedish ambassador Eric de Staël, she enjoyed some diplomatic protection during the Revolution, jockeying to get her friends and lovers into positions of power. Fairweather’s exciting account of the precipitous events of 1789 and onward is jam-packed with personalities revealed through snippets of constantly circulating letters. Through all the noise and turmoil, Madame de Staël’s enthusiastic and indomitable spirit emerges: demanding and protective of lovers like Louis de Narbonne and Talleyrand (who abandoned her to appease her nemesis, Napoleon); often heedless of public opinion (such as when bearing her lovers’ children); besotted of her superhuman father and manipulative of intellectual collaborators such as Benjamin Constant, who fell wildly in love with her and kept boredom at bay during her exile in Geneva. 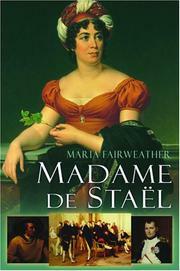 Though Fairweather’s treatment of de Staël’s literary work is a bit sketchy, her thoroughness in every other respect is heartening, and her devotion to her subject leaves never a dull moment here. An intimate, thrilling walk through Revolutionary Paris.